Geotextile Tubes and Bags can be used for a diverse range of eco-friendly solutions that solve ecological problems such as reducing wave action Hurricane Storm Protection erosion control at a beach. They can be used as a replacement of "Cells" for holding dredged spoils, and can dewater the spoils to provide sand to refurbish or create new beaches. 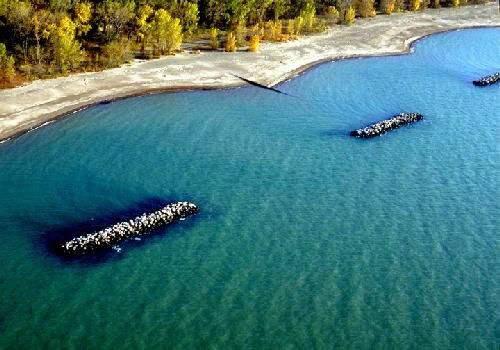 Geotextile Tubes and bags are being used worldwide for breakwaters and groins, replacing the costly method of rubble mound. The fabric used in GeoTextile Tubes and the seams used to create them have become stronger over the last few years, giving way to the idea that these tubes and bags, if protected, can last up to 50 years. Use of these tubes and bags have proven to be cost effective, and have added to their rapid growth in popularity over older, traditional methods. Fabric Formed Erosion Control Systems are used for armoring Hurricane Storm Protection breakwater or goin, retaining walls, reinforcing slopes, erosion control embankments, revetments and more. These concrete structions created from GeoTextile fabrics become a permanent structure and provide unprecedented protection from wave action, erosion, weather and other degrading factors in teh environment. They are formed in place at the construction site, need minimal personnel to employ, Hurricane Storm Protection can save huge amounts of money compared to older methods. Engineers and Contractors are becoming more aware of these methods and the popularity of this system is growing around the world. Contact SDMI dba Caribbean GeoTextiles to learn more about our products and services such as installation and consulting.